Once upon a time in the hills above present day Carlsbad, Leo Carrillo built his dream home and lived the life of an early California Don. Leo Carrillo was an actor and showman best known today for his last role, playing Pancho to the Cisco Kid in the popular 50s TV series. However, Carrillo had close ties to early California and was a descendant of Don Juan Bandini, the Estudillos and other early San Diego residents. 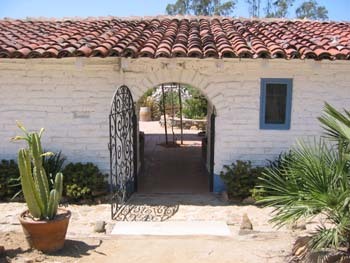 Although he maintained his main residence in Santa Monica, west of Los Angeles, he also wanted a hacienda and a foothold in the lifestyle of his ancestors. For that reason, Carrillo purchased a ruined adobe in North San Diego County and 2,538 acres of land in 1937 and began constructing his dream rancho. He built a low-slung adobe house, a swimming pool with a white sand beach, a barn, a bunkhouse and added 600 head of cattle and horses. 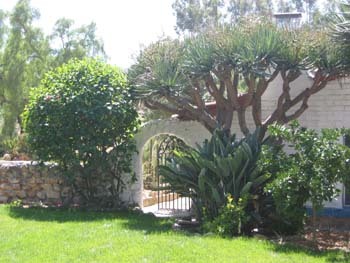 Once complete Carrillo invited his Hollywood friends to join him for "fandangos" and enjoy his hacienda. Carole Lombard, Clark Gable, Duncan Reynaldo, Jane Withers, Will Rogers and many more celebrities visited and enjoyed Carrillo's legendary hospitality. Carrillo died in 1961 and his daughter continued to live on the ranch until 1978. The ranch fell into disrepair and Carlsbad began to change into the current community of homes and business parks. The Carrillo Ranch Partnership acquired most of the land and began developing it for residents. However, 10.5 acres including the house and outbuildings were deeded to the City of Carlsbad for a park. That park is now a reality and visitors can tour Leo Carrillo's restored home and grounds. The house has been repaired and once again looks as it did when Carrillo and his family owned it. Tours are available on weekends -- Saturday. 11 am to 1 pm; Sunday, Noon to 2 pm -- and allow visitors to see the inside of the house and hear its history. Some of the original furnishings have been found and returned to the house. The park has hiking trails and is being replanted with native flora. The house is available to rent for parties, weddings and other events. There are plans for more renovation including a small theater that will be used to show Leo Carrillo's movies.